- Publisher Old Testament Challenge, Volume 4 is titled Pursuing Spiritual Authenticity: Life-Changing Words from the Prophets. The goal of OTC is to discover the life-changing truths of the Old Testament and how we can apply them to our lives today. Based on Pastor John Ortberg's OTC series at the New Community services of Willow Creek Community Church, this resource will enable churches to raise the level of biblical literacy and understanding among its congregation. 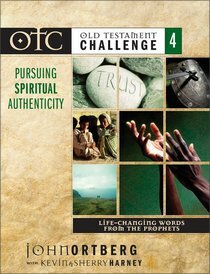 About "Otc #04: Pursuing Spiritual Authenticity Curriculum Kit (Old Testament Challenge)"
Old Testament Challenge, Volume 4 is titled Pursuing Spiritual Authenticity: Life-Changing Words from the Prophets. The goal of OTC is to discover the life-changing truths of the Old Testament and how we can apply them to our lives today. Based on Pastor John Ortberg's OTC series at the New Community services of Willow Creek Community Church, this resource will enable churches to raise the level of biblical literacy and understanding among its congregation. Kevin G. Harney is the Teaching Pastor and Evangelism Champion at Faith Church in Dyer, Indiana and Central Wesleyan Church in Holland, MI. He is also on the Teaching Team of the campus ministry at Grand Valley State University in Allendale, Michigan. He is author of Leadership from the Inside Out: Examining the Inner Life of a Healthy Church Leader; Seismic Shifts, the little changes that make a BIG difference in your life; John: An Intimate Look at the Saviour; Ephesians: Bringing Heaven to Earth, and co-author of the Willow Creek Interactions series, the Willow Creek New Community series, the Old Testament Challenge series, and Finding a Church You Can Love and Loving the Church You've Found. Kevin G. Harney serves at Shoreline Community Church in Monterey, California. Harney is the author of Organic Outreach for Ordinary People, Leadership from the Inside Out; Seismic Shifts; Finding a Church You Can Love and Loving the Church You've Found; and more than sixty small-group Bible studies. SPANISH BIO: Kevin G. Harney es pastor de ensenanza en Faith Church en Dyer, Indiana. Es autor de Seismic Shifts: the Little Changes that make a BIG difference in your life y coautor de varios libros.